While visiting an old friend in Kansas City, Missouri I took the opportunity to consult another medium. There were more to choose from than Tulsa and after looking at various websites I decided on Traci Bray. www.tracibray.com I met with her on Sunday morning at Union Station since her office was unavailable. We sat at a bench in a secluded area and at that time of the morning there were few people around so it was fairly quiet. It was a little distracting for me but apparently not at all for Traci. Fortunately she always provides a recording of her sessions. I had been distracted having fun with my friends over the weekend and I forgot to check the batteries in my recorder which turned out to be dead. The first person to come through she told me worked around airplanes as a mechanic, flight engineer or attendant. The only person I could think of was the father of a dear friend of mine who had been a mechanic for American Airlines. Traci asked me if this man started working on planes in the military because the plane took on an olive color. (He did) She asked if the name Jack or John was around the father. (My friend did not know who she could be referring to but her father did have a grandfather named Jack) Traci asked if my friend has a young child or grandchild because she was shown a toddler. (She does) Traci also stated that she bet he really, really loved popcorn and in fact that did have some special significance to my friend. When she was young she and her father would make popcorn and play chicken - they would take turns peeking under the lid until the first kernel popped then after the popcorn was made they would watch TV together and eat it. Then Traci surprised me by asking if there was anything I wanted to ask him. I had no idea what to ask him and felt totally unprepared. Of course after thinking about it I have a lot of questions now but I was almost totally blank during the reading. Never would I have thought this individual would come through but after thinking about why he did I think I know. His wife is 91 and is very frail and on hospice. I believe this was his way of letting his daughter know that he is around and aware of everything. Good grief, he even knows what I am up to! She asked if I knew a Frank or Francis or a priest who had passed. I did not. Traci asked if my dad had anything to do with architecture? I said no. She asked if he loved to read because the name Carnegie kept coming up and she would see it with an old library, which is why she thought he was some sort of an engineer or architect. I told her he was an engineer. She asked if he had lovely penmanship because she was seeing lovely writing and felt his signature was very important to him. In fact my father did have lovely handwriting for a man and his signature was beautiful - (especially when compared to my husband's writing!) Then she was seeing the Brooklyn Bridge and wanted to know if there was a New York connection for him and I said no. Asked if I been to New York recently and in fact I had made my first trip to New York City in April of this year. She wanted to know if I had been over the bridge or through the tunnel. I had not gone over the bridge but had been through the tunnel. Then Traci saw a gun and asked if anyone owned one or was in law enforcement? (Naturally I totally forgot about my nephew who is a boarder patrol agent!) Was anyone around my husband who died of a gunshot? Any siblings with guns? At the time I responded no, but upon reflection later I realized that my father did have a cousin who was killed in WWII of a gunshot wound. His cousin was in the Navy and was some sort of an engineer and they were out working on a bridge, I believe, when he was shot in the head by a sniper. She asked if the month of October was significant for my father. Yes, he was born in October. Then she asked me if I had any questions for him. The only thing I could think to ask was what was he doing over there. Impossible to validate but entertaining to listen to nonetheless. According to Traci when she asked him what he was doing over there he pointed to a picture of a red, shiny convertible that was in Union Station and told her that he drives there and goes fast. Just what I would expect him to be doing if he could. Cars were my father's favorite thing in life next to his family. There were always stacks of Motor Trend and other car magazines next to his chair. But then she said he was living with his mom and she was younger than when she died. Not what I would have expected him to be doing. My grandmother was wearing an apron with flour on it so Traci thought she must have been a good cook. About that I have no clue. Asked if my father liked to fish because he is fishing over there. I don't know how much he liked to fish. I remember he took me fishing once and I know when he was younger he went deep sea fishing. So, although he never talked about going fishing I assume it was something he enjoyed. Traci asked if my father had a brother who passed - No. Did my mother have a brother passed? Yes. Because she saw my father with someone who is a brother or brother like and in the same age group. I would expect this to be Charlie Henderson, who came through in my reading with Brandie. She asked if there was anyone with the initial B or L? No She kept hearing the name Lyndell. I never heard that name before. I was then asked if I had an old boyfriend who passed away? Yes - actually I had two who died but for some reason I only remembered one during the reading. Traci asked me his name and I told her it was Artie. She asked me if he had cancer because she saw that he had something that went pretty fast like the flesh eating bacteria. I didn't find out about Artie's untimely demise until a few years after his death and his obituary did not state the cause of death. It also could have been Bill - I learned about his death a few years after he passed..
Next she asked who the photographer was and that could have been my father or my sister. She asked if I had a son and I don't. Then she asked what kids I did have and I told her two daughters. Did either of them model? No. She wondered if either of them had any professional photographs taken recently? My oldest daughter had recently been married and had a professional photographer at her wedding. Traci said that my dad (or sister) was there trying to help the photographer to take perfect pictures. Traci saw the presidents who are on money and wanted to know if I knew of anyone with the name of one of those presidents. My father-in-law was named George. There were about five other points she asked about him that did not fit at all until she asked if someone around him was in the medical profession and George does have a son who is a pharmacist. Interestingly, she asked if my mother-in-law's name was the middle name of one of my daughters and I said no. She asked if my mother's middle name was given to my oldest daughter and that is correct. Legally my mother did not have a middle name but always wanted one so she picked Elizabeth and for most of my life I thought that was really her middle name. Traci asked if my mother died in her sleep or was she comatose and that is correct. She saw that her care had been terminated (correct) and my mother related that she thought we did the right thing. Then Traci saw clothes pins. Go figure. I was asked again if I had any questions so I asked the same one - what is she doing over there. Traci wanted to know if my mother played the organ or any instrument with a valve. Never. Traci saw bunches of embrodery thread and that my mother was around fabrics and threads. That was surprising and spot on because my mother was amazing at making clothes. She could copy anything we saw in a store. She could also upolster furniture like a professional. On to the next person, Traci asked if I knew anyone with the name of Jennie, Jamie or Joannie - a name that started with J and ended with the y sound. I told her yes - Judy. Traci asked me how she died and I responded that she had died after an elective surgery that required only one day in the hospital. She asked me if Judy had indicated before she went to the hospital that she was worried about the outcome. Judy had never worried about having surgery before in the past and the surgery she was going to have was very common. However, weeks before she went to the hospital she was leaving instructions with her daughters in the event she did not make it through surgery. Traci asked if Judy's husband traveled for work. No - Did Judy travel? Oh yes, and when not traveling she was planning on where to go next. Did she love seafood? Judy adored shrimp. Do I have any questions for her? Same one I always asked - what is she doing over there? I was astonished when the first word out of Traci's mouth was "art" and sewing projects. Judy was an artist. Had Judy been into women's rights? Heaven's no. Any survivors around her named Bryon or Bryce? No. At this point Traci started asking about different people, none of whom were connected to me. There was someone who loved racing fast cars; Gene, a funny guy with a mustache; a gambler who got lucky a lot; someone with the last name of Klein; a Jack or a John. Since we were now getting nowhere she asked me who I wanted to hear from so I asked her to see if she could connect with a woman I had known, Karen. This connection turned out to be extremely accurate. The first thing Traci said about Karen was that she was philantrophic and that she donated time and volunteered a lot. That was definitely Karen who was a social worker at a hospice and she did donate countless hours. Traci saw a kitchen aid mixer then a drill - not sure what that was supposed to mean. But then she saw a stringed instrument and that was significant - Karen's husband played guitar in a band. Traci saw sticky buns and wanted to know if Karen loved sweets. Absolutely Traci mentioned a few other things that I really did not know if they were correct or not. Traci asked if she had died from an illness and I said yes. Then I was absolutely shocked when Traci said "it was her brain, wasn't it." Karen died from a brain tumor. Then came another shock when Traci said "Karen says see you later alligator." Karen used to say that a lot. In this reading Traci was spot on about a lot of things but there were also a lot of things that she wasn't. At a glance I would say she is at least over 60% accurate, but for now that is just an estimate, it could be higher. It was harder to estimate her accuracy because she asked many more questions then I was used to during a reading and came up with a lot of names that had no connection to me. She had a somewhat different method of reading as compared to Brandi and that takes an adjustment on my part to get used to. A couple of weeks ago I drove to Kansas City for a weekend with several of my good friends. The highlight of our weekend (besides just being together) was another visit to Atchison, Kansas. Atchison's claim to fame is mainly from being the birthplace of Emilia Earhart. 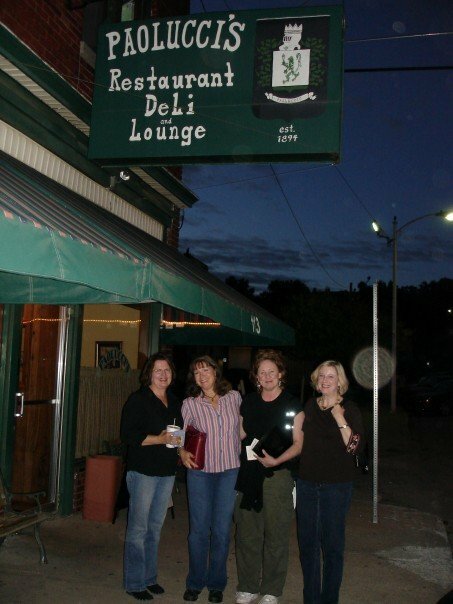 In recent years, however, Atchison has now become a destination for those interested in the paranormal. It is the home of the Sally House, a house purportedly haunted by a little girl named Sally. The Sally House has been shown on shows about hauntings which has resulted in a paranormal industry of sorts in Atchison. Every October there are daily trolley tours around town to all haunted homes, some of which offer private tours. Our first year to visit there we went on the trolley tour and found it very entertaining. Of course there are mediums (whose time slots fill up quickly) and a spirit fair (which we missed). If you like to take pictures of orbs, then Atchison is a great place to go. On the trolley tour we took photos of all the haunted homes, including the Sally house, and found numerous orbs in our pictures. We even had a huge orb in our group photo after dinner at Paolucci's. (Very good Italian.) Actually it was the biggest orb we captured all evening. As far as I can tell the orb is behind the post. 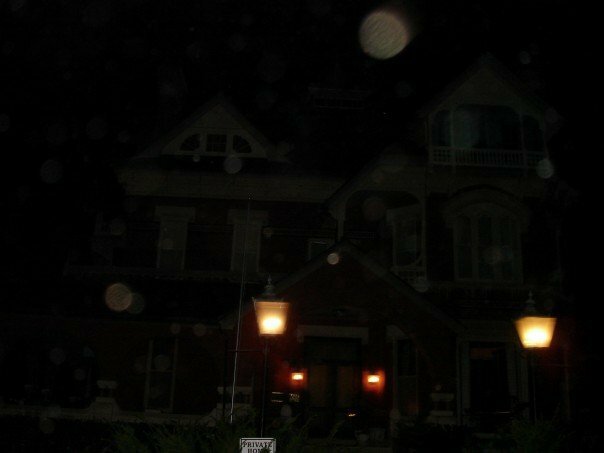 Typical Atchison haunted house with orbs. This year we skipped the trolley tour and went to a gallery on Saturday night which also included a dinner. Not a bad deal for $45! As it turned out the medium giving the gallery, Traci Bray, was the same one I had made an appointment with the next day. This gallery had about 60 people attending and the late husband my friend Karen came through. Not surprisingly Karen went almost totally blank when Traci was talking to her. Traci asked about a ferret and Karen had no clue what she could have been talking about. After the gallery was over she remembered that her daughter did have a pet ferret at one time. Traci had stated there was something significant about the end of Dec - first of Jan time frame and once again Karen had no clue. Later when we were discussing the reading I asked her when she and Dave were married. It was Jan 2. I don't think this type of amnesia is unusual at readings (of course I've seen this when watching John Edward!). At one point Traci described someone on a motorcycle who seemed to fall in slow motion. This did not seem to fit for anyone since the room was silent and she went on to another spirit. After the gallery was over did I remember a drunk I had literally helped pull a motorcycle off of who had fallen at a stop light. He was an older man in his 60's and he actually got back on his bike and tried to ride away - but only managed to roll a few feet before he slowly fell to the side and was back on the street with his bike on him once again. He died the day before I had to testify at his hearing and I couldn't help but wonder if maybe that was him. Not sure I would want to hear what he had to say! For more Atchison orb pictures see my post of 9/7/2013. This summer I attended a gallery which is a demonstration of a psychic medium's abilities. It is basically a group reading and the cost is normally very reasonable ($25-$35). A gallery usually will last a couple of hours and unfortunately not everyone will get a reading. But it does help you decide if the medium seems accurate enough that you want to make an appointment for a reading with him/her. The gallery I attended with two of my friends showcased Brandie Chrisman and she had a turnout of about 30 people. She appeared to be just as accurate here as she was in my readings. There was one particularly emotional reading for a woman whose late husband came through with their child. Apparently he had a few things to apologize for. Interestingly, there was a young man who came through who seemed to fit for more than one person, one of whom was one of my friends. I have seen this happen on John Edward's show. A grandmother came through with enough specific information (she was a dancer) that her grandson could identify her and on Brandie's website, www.brandiechrisman.com there is a video of that particular reading.